Dr. Riccardo Panella received his Master’s Degree in Chemical Biotechnology from the University of Perugia in Italy. He went on to receive his PhD in Oncology from the same university, and completed his Thesis on Protein-Protein Inhibition through Small Peptide as a therapeutic tool in AML, under the lead of Prof Francesco Grignani. 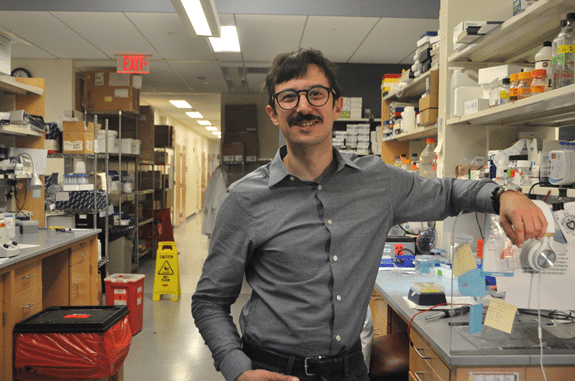 He moved to Pier Paolo Pandolfi lab at the Harvard Medical School Cancer Center in Boston in 2014 to study cancer genetics from the non-coding prospective. Riccardo is carrying on several project on microRNA deregulation in cancer pathogenesis and maintenance, as well as metabolism, metastasis development and chemoterapic resistance, in Leukemia and Breast Cancer. Riccardo’s research is currently focused on the miRNAs function in tumorigenesis and tumor maintenance. He is also focused on the development of therapeutic tools based on miRNAs inhibition or overexertion.